A few words spring to one's mind to describe the gaming experiences we have with Take Two - engaging, controversial, genre inspiring, and occasionally, delayed. Well, the press conference they held was not delayed, but if you got there early in order to catch a good pre-glimpse of anything, you were told that you had to wait. Even with the short wait, it was well worth it to hear what the hot video game company will have to offer to the gaming world soon. Of course, top on my list was more Grand Theft Auto IV info. After a few stern warnings against the use of cameras of any kind, things got underway. Strauss Zelnick, the new chairman of Take Two took the stage expressing the company's commitment to making "AAA" games. This, of course, is always pleasing to hear from any developer or publisher. Zelnick continued on talking about their commitment to be "at the cusp and inflection point of entertainment." Zelnick then introduced Fireaxis co-founder Sid Meier. 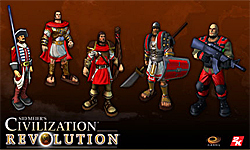 Some footage of Civilization Revolution rolled on the screen. Unfortunately, we have already seen the trailer before with narration from rock legend Henry Rollins. Regrettably, Mr. Rollins was not present at the conference. Once Sid takes the stage, the trailer begins again. There is some rushing by the AV crew, and while they fix the feed to show some other footage of the game, Sid boasts that Civilization Revolution is a "worldwide phenomenon." Once the footage finally seems to begin working correctly, Sid begins demoing the game for a little bit showing off some of the game's highlights. The game will have a Civilepedia that we will be able to access online. He also talked about how the game will have a game of the week feature to incorporate a leaderboard type function for the game. Sid does stress, after a few minutes of showing off the battle mechanics and animations, that there will be ways to reach victory without war. I, for one, cannot wait to see some more of the interesting game. Next up, we were given a nice montage of the 2K Sports games. There were several shots of All-Pro Football 2K8. Jeff Thomas took the stage to go over a couple of features we could expect from the title. The game will feature 240 of the best players of all time; in the game are the "create a" features we have come to expect from sports games. Once your team obtains victory there will some interesting animations for celebrating. Jeff further states that All-Pro will return football to football. Returning the sports genre to when it was fun. Allowing players to do all the things they used to be able to do, unlike now where we are always being told you can't do that in a league-approved game. Jeff continues to stress that this game will be about the creation of your team, and that when playing online it should make for some interesting gameplay. 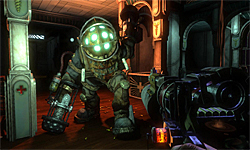 Then we moved onto one of my anticipated games, BioShock. We get a few clips from the game before the demo begins for the game. It is shown that the game will begin in 1960 in the mid-Atlantic. An eerie underwater scene unnerves a few people including myself. A bit of a warning, if you have a fear of drowning this may not be the sequence of footage you should see. The graphics look great and seem to be blending the humor of Fallout and a little of the creepy side of Lost's Dharma Initiative. Either way, if I was not already anticipating this game, I would be now. Finally came the news that most seemed to be waiting for, Grand Theft Auto IV. Zelnick shows off the first two monumental trailers again. 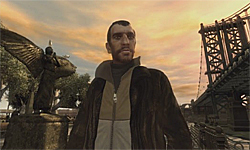 After Niko Bellic's words ring through the room, the developers took the stage. They, of course, tell us how the demo was going to be short, a work in progress, yada yada yada. We see Niko in the Times Square replica, after a few moments he steals a luxury sedan and drives around the impressive looking Liberty City. The lighting effects are great and the animations are solid enough. A little jumpy but again this is a work in progress so we can rest easy in that this should be fixed by this October. The lighting effects are shown off a little more as Niko pulls under the Broker Bridge and watches the sunrise. The lighting reflects off the water, giving it that realistic look not previously shown in any of the GTA games. Just as we started to get comfortable to watch a nice little bit of GTA IV, we watched as Niko called up a friend to "get some firepower," and the demo was over. So was the conference.